This wasn't the deadest of dead rubbers. Two knocked-out teams - Rising Pune Supergiants and Kings XI Punjab - were desperate not to finish at the bottom of the pile. It ultimately boiled down to 12 off the last two balls, with MS Dhoni, the fading star, facing off against Axar Patel, the rising star. 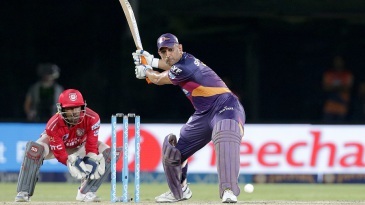 Dhoni unleashed his attacking avatar to bring back memories of his heyday; his back-to-back sixes over midwicket delivered Supergiants a sensational four-wicket win in Visakhapatnam. The final over began with Supergiants needing 23. M Vijay's key men in the end overs - Mohit Sharma and Sandeep Sharma - had bowled out. Axar was in the hot seat. Dhoni may have struggled for timing and power throughout the season, but this wasn't beyond him.